I started cooking as the oldest of five kids when my mother went back to college. My mother pushed me into the kitchen. She started me with Peg Bracken’s I Hate to Cook Book.I was the camp staff cook for Chin Be Gota Boy Scout Camp in the summer of 1969, where I learned about large quantities (1000 chickens) and public tastes.My grandmothers were both great cooks, in different ways. They did not teach me, but I observed what was served. My love of red cabbage comes from Grandma Rayfield. Grandma Alexander let Grandpa cook the fresh fish on fishing trips, but handled the frozen fish we brought home. One day she took me to the Art Institute and introduced me to ratatouille. On our next trip, she took me to Benihana of Tokyo where the food was prepped and cooked at our table. She graciously grabbed the check from my college hands too. I have made peanut brittle since college days as a Christmas gift to family. My first mother-in-law was the 13th kid in a New Hampshire farm family, and stressed the importance of fine fresh ingredients. I met Holliday in August, 1993 The next summer I was taken to her family’s summer home in Maine where her father, Louis Kane, the founder of Au Bon Pain and Panera restaurants, had prepared lobster salad stuffed in lobster shells for 20 people. I offered to help plate the food. I explained to another kitchen helper that the garnishes on each plate were to make the lobster look its best. I got a smile from him, and knew I could fit it. I learned from Louis, and his friends in the kitchen, with an emphasis on relaxed fresh taste. A Japanese tea master and artist, Kaji Aso, observed how I enjoyed the Zen of putting fish and vegetables on and off the grill. He used the idiom for this in his country, for anything that relaxed but also stands up with excitement and pleasure. He said I was “upstanding at the grill”. Holliday’s friends Jeanne and Kalle from Germany loved to cook on vacation with us, and I came to see cooking as recreation, something perhaps rushed at home, but relaxed on vacation. Holliday and I love the time we have together in the kitchen, though it took us several years to design and build our home kitchen. I can always count on her for steering, or salt correction. Thanks to her careful research, our kitchen has standard consumer appliances. They are ones with just the right features, like responsive gas controls and oven temp down to 100 on our Maytag stove, and freezer on bottom and lots of rooms. No frills on the frig, except for magnets and photos. For our wedding, we received a bread machine, with a very joking card, in the shade of Au Bon Pain. But I wore it out, and have worn out several others, trying all sorts of spices and extras to brighten our bread life. There’s still a working Zojirushi on the counter. When I am too tired to bake, I can use it to at least handle the mixing and rising. One day a customer gave me some sourdough starter. Life changed. Now I hand knead and hand shape boules after the first rise, and bake on stones in a hot oven. I mix my dough for eight loaves in side-by-side Kitchen Aid mixers. Now I bake four or five times a week, for family and friends, charities, and, for the last year, seven loaves on Tuesday and seven loaves on Thursday for the local food shelf. I take my starter and sesame seeds, and bake on vacation anywhere- including England and Aspen. I look through cookbooks, listen to Lynn Rosetto Casper’s Splendid Table on the radio, and I took a class on how to make hot cross buns with the church ladies at King Arthur Flour. I buy my King Arthur bread flour in 50 pound bags, and my Butterworks Farm whole wheat flour in 25 pound bags. I used a large fish poacher to make a huge loaf of bread for the 50th anniversary of the UCC at our church. But what’s really important is that kids love my bread, crust and all. I love to walk the aisle at the grocery store, wondering what to make for dinner or for a crowd, and sometimes I get a good idea. Even the bad ideas have provided some laughs. Lovely pink salmon was turned sickly dark purple in a red wine poaching solution for important guests. But it tasted fine. When in doubt, make sure to serve a side dish of something tried and true, like bowties with fresh pesto. Sophie ignores me except in the cookie department, but Miranda is turning into a good baker. Rikki is blessed with her mother’s training, and my inventiveness. Feed your children well. Teach your children well, and eat well along the way. Cook with and for people you like and love. Bon appetit! I bake bread three or four times a week, mostly sesame sourdough, contributing much of it to the local food shelf. My Cub Scout Pack does “Big Bakes” at our church; the boys bake bread to take home but donate most to a food shelf. Holliday and I chair the annual Columbus Day chicken pie supper at my Masonic lodge. I cook for large family dinners, and for other masonic dinners. Often I do large salmon on a grill. But I also do salads, lobster pea soup and other cold soups, prosciutto.parmesan.portabella fettucine, waffles, ice cream and sorbets, venison and elk stews, peanut brittle, cashew brittle, and spiced bananas. Spiced BananasPut these hot spicy bananas on a plate with a few segments of mandarin orange and few slices of fresh pear, fresh mint leaf garnish, and you have a memorable alternative to Del Monte fruit cup as a starter. This spiced banana recipe is from the Copper Kettle, a famous international restuarant in Aspen in the 1960s and 1970s. Bring this mix, and then drop in bananas for 2-3 minutes, turning once. Serve hot and pungent. Save the poaching solution in frig for next time. I know this sounds weird, but it is a hit. Unexpected, and a nice complement to small servings of fresh or even canned fruit. Basically equally parts sugar, corn syrup, butter, cocoa, and dark rum. So, one cup sugar, one cup corn syrup, and two sticks (1 cup) of butter, stir over heat till hot. Turn off heat and add in one cup cocoa and one cup rum, stir till smooth. More heat at this time drive cocoa flavor into air instead of keeping it in sauce. I only use dark rums like Myers or Gosling Black Label. We are lookign for the dark sugar taste not alcohol. I usually use only about 1/2 cup rum, and add a half cup of water. Or 2/3 and 1/3. Add some heat if it is too thin, add some rum to thin it out. will make it thicken. My most common mistake is to make it too thick. Why is there no rum? And where did all the ice cream go? Obviously fine on vanilla or chocolate ice cream, but my favorite it to pour it over black raspberry ice cream. Just about any cocoa will do- Herseys et al. Ghiradelli is a step up. to empty the can, or boost the choco-meter. Buy stew meat, or chop up what you have. Drain well. Since the meat is lean, put a couple tablespoons of olive oil is a big fry pan and brown the meat. Since it often juices up before it gets dark brown unless you have a commercial stove, I slip in under the broiler for a few minutes to give some dark flavor to it. Then dump it into the stock pot. ½ onion- I like to cut in half, peel, then cut “moon” wedges. For the venison which had more flavor than the elk, I browned the onions in the fry pan with a little sugar to give a darker carmelized onion flavor to match the meat. For my Elk Stew I added a bag of fresh cranberries. I’d have added dried mushrooms if I had them. Could have had more cranberries- a bag per four lbs of meat. For my Venison Stew I added a half head of red cabbage, sliced thin, and a half cup of fresh chopped rosemary for a eight pounds of meat. After this simmered overnight, I added a half cup of my sourdough starter (which half flour and half water) just for a little thickening and flavor. See my bread recipes for info on sourdough’s benefits. The venison needed another half teaspoon of salt, perhaps due to the cabbage. Anyway, adjust your salt after the overnight simmering. This is my first stab at game stew, and it was down the hatch, with seconds for everyone I was told. Fifty guys ate about 15 pounds of meat. That three tenths of a pound per guy, plus ham and egg sandwiches and corn chowder, and the stew vegetables. Then apple pie with cheese and ice cream. Anyway, my philosophy was spices and flavors to stand up but not overwhelm the game flavor, with a blend of fairly well-known spices, potatoes and carrots to absorb and carry flavor with so little oil. Broiling the meat darker, caramelizing the onions, the Worchestershire or BBQ sauce, the balsamic vinegar, and the pepper all are rich dark flavorings to complement and take the strange edge off the game. I doubted the fresh rosemary would work, but its pine-like richness seemed to be appreciated- it raised questions. Thanks to Joy of Cooking and all the web sites I peeked at before charging into the kitchen. I thought cranberry would be cool for some reason, and I Googled elk and cranberry, and found I was not crazy. So use your imagination, look at what’s available in your kitchen or store, and Google your ideas to see if someone may say it worked. Still your idea. Same idea with the red cabbage and venison- I thought red cabbage with vinegar, apples, and caraway would be a great side dish, so why not put it right in the stew. Google said- yes- been done, works. I still think I got lucky. 1/4 tsp cumin or more! 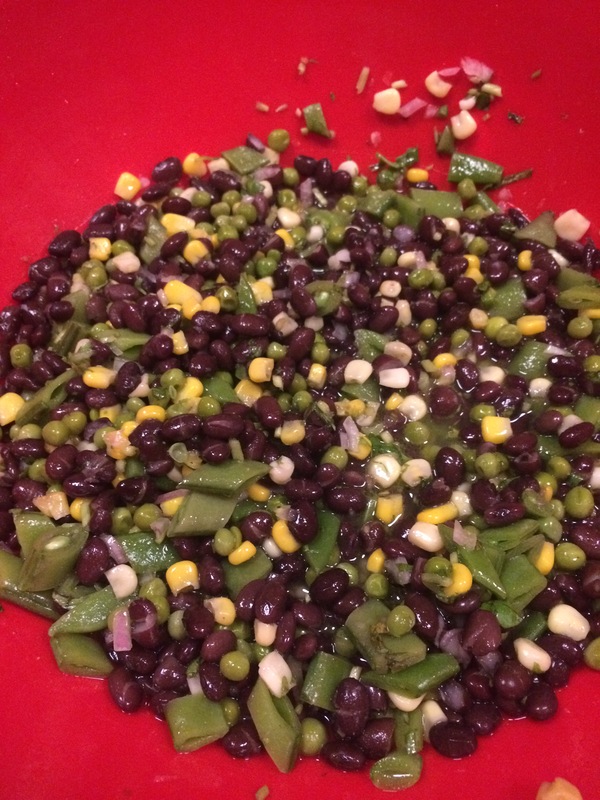 The flash frozen Birdseye corn and baby peas in this salad do not need to be cooked, and they cool the salad right down. The snap peas, onion, and cilantro are raw. The beans are cooked. I adjust the sweet and sour- the maple syrup and cider vinegar- shortly before serving, so that it is sweet but tangy. If I am not in my kitchen, it is easier to adjust sweet with white sugar sometimes. Nothing sacred here- adjust quantities to suit what you like or have. I am loyal to Birdseye because of availability and quality and because I read a biography of Clarence Birdseye who was quite an adventurer, scientist, and inventor as he developed “frozen food”, initially frozen fish. 1/2 – 1 teaspoon ground cumin 1/2 tsp salt. I mix my own melange of six peppers, which are my personal preference. Black, white, pink, green, Schzechuan, and long. I urge every cook to decide which peppercorns they like in what portions, and grind fresh always. My proud opinion. Make sure you at least try to include the almost forgotten but formerly common “long pepper” that is native to Europe, and preceeded West Indies spicing. Sort of rich and sweet. The long peppercorns need to be chopped to fit in a standard pepper grinder with the other peppercorns. I use a nut chopper. They are hard and jump around with a knife and cutting board. This batch needed more corn. I have been making peanut brittle since 1973, when I was too broke in college to buy Christmas presents. I make a maple-flavored peanut brittle most of the time. I also make cashew and sesame seed brittles, and others. I use the same pot I started with in 1973, an old pressure cooker bottom with a big handle. Instead of a candy thermometer I now use an infrared electronic thermometer. I make five pound batches poured out on a slab of granite which replaced the recycled men’s room marble I used to have. I buy peanuts from the Sunland Peanut Cooperative in Portales new Mexico, where the world’s best Valencia peanuts are grown. Aside from family, I put together packets of peanut brittle for auction at local charity events. The sample bag gets nibbled by the bidders, and the price goes up. $35 was top bid so far. Summer is too humid for keeping peanut brittle from sticking- winter food mostly. Keeps fairly well in sealed jars, but there is fresh butter in it. Eat it. When it reaches 240 F, add 5 cups of raw peanuts. Stir to avoid burning as the cooled syrup warms up again from the cool peanuts. At 305 to 310 F (hard crack stage) add 3 tablespoons butter, stir in, then 1 /4 teaspoon baking soda which will cause it to foam up a bit- this helps it turn out thinner. Pour out on buttered and salted surface- granite or marble preferred, but I used to do it on a Formica kitchen table. Spread it out with spoon or silicone spatula. After it cools a few minutes, use spatula to be sure it is not sticking, and use cotton gloves on hands to pull sides out the make it thinner and easier to break/chew. I lightly butter the gloves. I grill big salmon at the beach in Maine for family dinners. I love to grill salmon dinner for a lot of people. 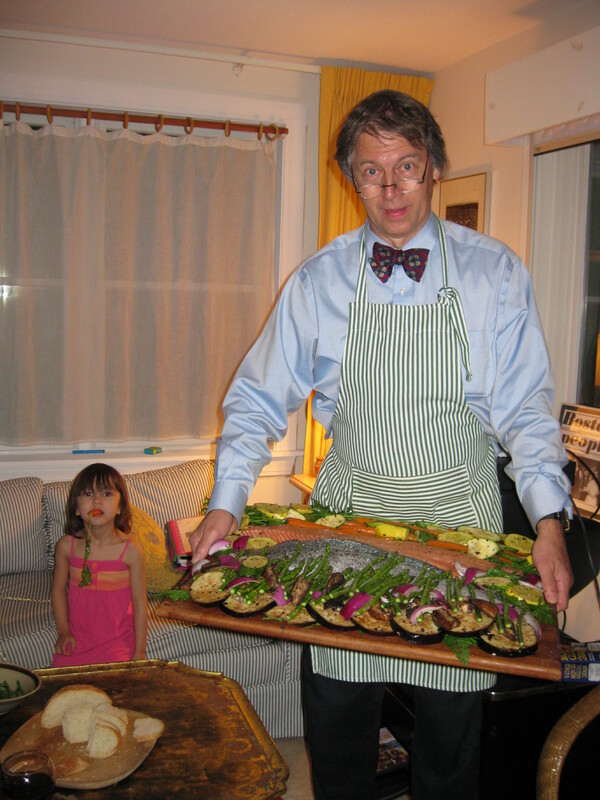 WIth the salmon, I like to grill red onions, mushrooms, yellow and green summer squash, eggplant, sweet potato rondelles, snap peas, or whatever looks good at the market. I like to warm the salmon up on the top shelf while I grill the veggies. Nice to be evenly 156 degrees throughout, but browned. Hard to do with a cold fish to start. Best salmon ever was when I ran out of propane and patiently waited for the salmon to cook up to perfection while the grill cooled. The salmon god smiled after tweaking my luck. Salmon doesn’t need anything other than olive oil, salt and pepper, in my book. But I sometimes chop up chives, use a brown sugar based Alaskan rub with paprika etc, or drizzle a chopped up mixture of toasted almonds and candied ginger. Sure helps to drop some maple twigs into the grill to add some sweet smoke. The shorter the time between coming off the grill and onto the palate, the greater the likelihood of amazing salmon. Best to stand at the grill and pick off little pieces. Trout is a member of the salmon family. Rainbow trout stay in small rivers, and are the same species as the large Salmon brothers “Steelhead trout”. Baby rainbows head upstream and stay in fresh water. Baby Steelhead swim out to the ocean and grow big in saltwater. Which babies decide to go which way? Don’t know. Wonderful mystery of life, and delicious either way. Grind up these spices for “Copper Kettle” Trout Elsinore, which can sprinkle on trout or any other salmon. 4 t salt, 1 t thyme, 3 t caraway seed, 2 t celery seed, 2 t fennel seed, 1/2 t cayenne, 1 t garlic powder, 1/4 t fine herbes. I grind them in my coffee grinder or blender. A Couple Cold Soups-easy, summer veggie/herb fresh, cold soup, but rich. Play around. I suggest starting fat, and then slendering down the recipe. Cut all but one cuke into chunks and feed into a blender, with a ½ cup water to get started. Keep feeding cuke chunks into blender until all pureed, except that one set aside. Salt, pepper, some slices of jalapeno peppers, fresh dill. About a whole bunch of dill, maybe 2 tsp salt. Be careful of jalapeno, but do use it. Add some lobster stock or other stock to thin it out and add flavor if desired. Add in a quart of whole milk plain yogurt. So more cukes than yogurt. Chop up the remaining cuke into tiny bits, but do not blend. Toss into soup. Stir or shake. Add ice if you need it chilled right away. escape the pea soup… as shown in photo. Adjust salt to taste. Adjust jalapeno to taste. Do this by pouring a cup back in the blender, add your spices, blend, and then return to the soup. Yes you could use less fat in the yogurt. It’s your palate. but instead you get fresh pea flavor and light seafood. Grill some scallops, or lobster, or shrimp. 3 lbs of frozen petit sweet peas, thaw them. that’s right, fresh raw not cooked! Chopped fresh ginger, salt and pepper, and fresh onion. Serve with scallops or other seafood sprinkled on top. NEW VERSION 2016- More lobster flavor! Remove lobsters and save water. Take claw, knuckle, and tail meat. Toss in some butter or olive oil to carry lobster flavor. Bring to boil and mash to produce nice lobster stock. Toss in some butter or olive oil to carry lobster flavor. Simmer for a long time if you want lobster smell in your house instead of in stock. I let the big pot cool overnight. Load blender with 1 cup Half and Half, 1 cup lobster stock, and one bag (13 oz) rinsed Birdseye frozen Baby Garden Peas. (uncooked, and rinsed to keep batch from freezing in blender). Blend 30 seconds. Makes as many batches as you wish. Frozen peas, cold cream and warm/room temp stock yield nice cold soup. Ready to serve with chopped up lobster meat or any other seafood. Lobster stock is mild and delicious and complements fresh raw peas. Salty water means you do not need additional salt. If too salty, be patient, peas will absorb salt. Add a dash of salt as needed, or pepper, or raw ginger, or Old Bay seasoning. But the intent is nice clean fresh green pea and lobster flavor. A rich stock could easily cover these delicate flavors. or use Old Bay Seasoning. Salt and pepper of course. Fresh thyme and savory are better than dry. before serving. Juicy and not completely soft. a somewhat curry warm wide spice. I love cumin, but it instantly signals” chilli” in this soup.I never make it the same. Summer savory of winter savory. on accompanying dishes and availability of fresh herbs. Fresh herbs rock in any dish. same as above but fresh berries instead of bananas. Nine inch diameter rounded bowl is ideal. Mix flour, salt and baking powder with whisk. Add shortening/butter and cut in with pastry cutter. When cut in smoothly, add milk and mix with table knife. Dump on counter and knead MINIMUM to mix. Use biscuit cutter without twisting. Combine scraps, roll out, and cut more. Stack on floured board in 4×6 pattern. Drop on chicken pie already bubbling in 450 oven. Baste with milk using brush. yeast sesame bread, streched out to look like baguettes. A lone boule ready to be enjoyed.